Aaron’s Story – Part 3 – He Said What?! We made our last military move in June of 1999. Gary had retired from the Army and taken a job in Wichita, Kansas. Gary, Aaron, and I had already made a quick house hunting trip, had bought a house, and so we moved in on July 3, 1999. Our lives as civilians had begun! We spent the summer unpacking, working on our house (still not done! ), and just adjusting to our new town and our new lives. And I immediately set about getting Aaron established with doctors, as well as making dozens of phone calls to see what services might be available to us that would benefit Aaron. There were shut doors and there were open doors as we settled into our life in Wichita. I was starting to get a handle on what I needed to do – slowly. I continued to home school all the children, including Aaron. That first year in Wichita I taught him totally at home. 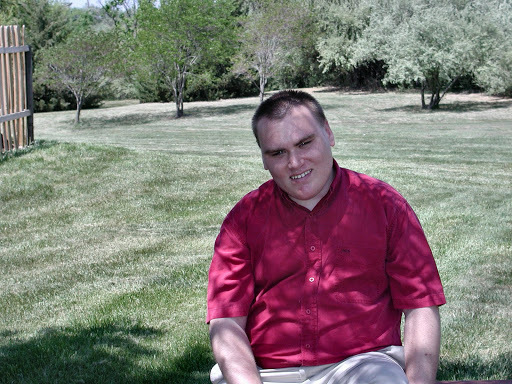 Our second year we had a wonderful tutor for Aaron, a friend from church with a degree in special ed. Amy did a fantastic job working with Aaron on several subjects, and I continued to teach him the others. I soon realized, though, that Aaron was reaching a point where he had probably learned all he could as far as math, grammar, etc. We needed to think about preparing him for the adult world. We had learned about a school in Wichita that taught young adult students how to function in the working world, so I made inquiries and we began the process of getting Aaron enrolled in this school. Aaron had to be placed there through the local high school. 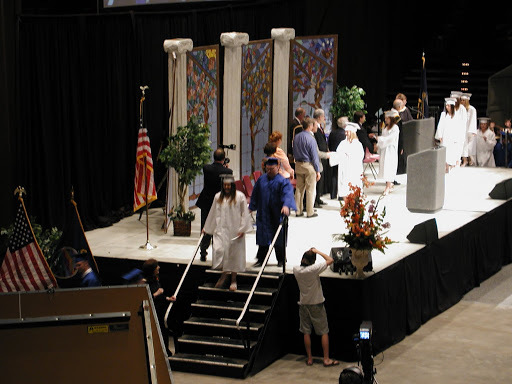 which meant that we had to enroll Aaron in Goddard High School so that he could transfer to the job skills school. 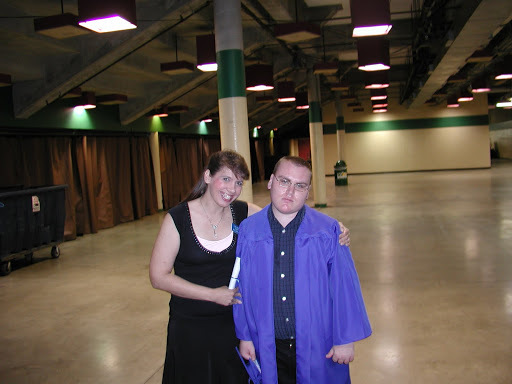 He went through both academic and psychological testing, and we had many meetings as we set up an IEP (Individual Education Plan) and got other issues ironed out. The staff at Goddard worked so well with us and we were very pleased. Aaron started at his new school in the fall of 2001. This school had many good concepts and in some ways was a positive place for Aaron. There was a parent group that met and through that we learned so many things we needed to know, such as when and how to pursue guardianship, what state services were available, the importance of a case manager, etc. However, some of the staff at this school really didn’t understand Aaron. The more they pushed Aaron, yelled at him or belittled him, the more he reacted. No one was happy! Our second year there, Aaron had a one-on-one para. She was so kind and caring, and was a life saver to Aaron and to us during that year. But I continued to get the phone calls from the school about Aaron, we contined to have meetings to try to solve issues, and finally we all knew that Aaron had to transfer somewhere else. This was a very stressful time for all of us. We were so afraid of what the next school would hold for Aaron. That next school was the Goddard Day School, here in our school district and near the high school where he was enrolled. This school was a transition school for those who couldn’t function in a regular school setting. Before Aaron started classes, Gary and I got a phone call from his new teacher, Tom Szambecki. Tom was near our age and had just gotten his degree in special ed. after working in other fields. This was something he had always wanted to do – and we soon learned why. Tom was amazing! He was warm, patient, kind, and wise. During that first phone call, Tom introduced himself to us and assured us that he had Aaron’s best interests at heart. The entire staff at the day school had such an understanding of Aaron. It was a very positive and nurturing three years there for Aaron. He even attended some classes at the big high school, marching in with Tom on that first day as if he owned the place. Sure, there were bumps in the road but with a caring staff we were able to navigate over the bumps without having a major crash every few days. Aaron even went to summer school there during that time and loved it! Medically, we eventually became patients at the Epilepsy Center in Wichita. Again, this has been such a gift from God to us and to Aaron. The doctor there, an Epileptologist, and his staff have been awesome in helping Aaron with his seizures. In 2003, Aaron was in the hospital for five days as he had a Video EEG. This test helped confirm what new treatment might be best for seizure control. In 2004, Aaron had surgery to have a Vagal Nerve Stimulator inserted into his chest. The wire then connects to his Vagal nerve in his neck. This is all similar to a pacemaker. Shocks from the VNS travel to the brain and can help control seizures. Aaron had lots of adjustments done to the VNS and many doctor visits to monitor his progress. However, Aaron was one of those rare patients for whom the VNS actually seemed to make his condition worse. Seizures were increasing and he was having 12 or more big seizures a month as well as other kinds, and having more seizures during the day than he had been having. We eventually had to have the VNS turned off. Now Aaron’s seizures are almost always during the night when he’s sleeping, and he doesn’t have nearly as many as he used to have. 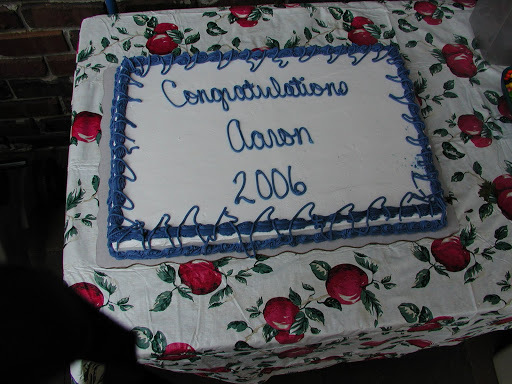 In May of 2006, Aaron graduated from Goddard High School. 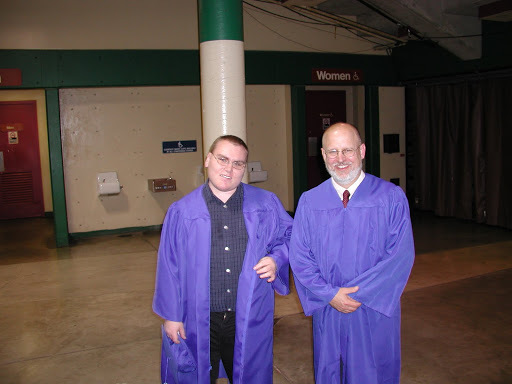 He marched with the regular graduating class in the Coliseum with Tom at his side. How awesome! 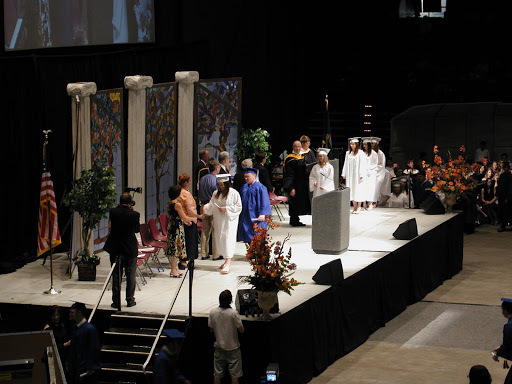 Aaron was allowed to be one of the first to receive his diploma so that we could leave afterwards. It’s just too hard for Aaron to sit there for such a long time and besides, we were going to get pizza! That’s the real reason that Aaron was there and he wanted to get on with it! This was such a great milestone for Aaron and a great testimony to God’s faithfulness. But now what would Aaron do? What door would God open now? That’s next!